We understand it is not always feasible for our customers to procure new equipment; in fact, Bowers Electricals started life as repairers and re-manufacturers of transformers and switchgear. Our engineers’ knowledge along with our specialist workshops have been developed for refurbishment of all customers’ property, including distribution and power transformers, high and low voltage switchgear, rotating machines and associated distribution, control and power equipment. 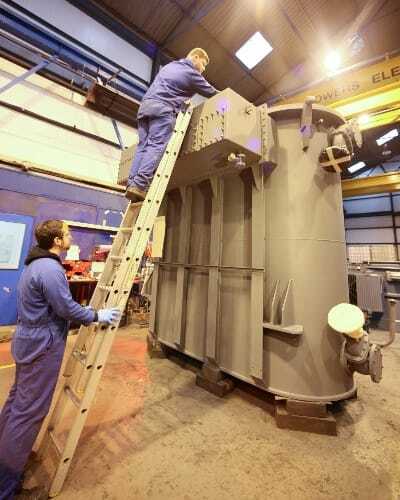 Our site facilities include substantial workshops within our three acre site, offering rewind facilities, assembly areas, machine shops, several specialist test bays and drying ovens. All our workshops have large crane capacities, up to 30 tonnes, and our large transformer refurbishing bay allows for transformers up to 30MVA to be overhauled. Contact our sales team for a consultation and quotation and find out how we can help you re-engineer and extend the productive life of all your power engineering equipment.